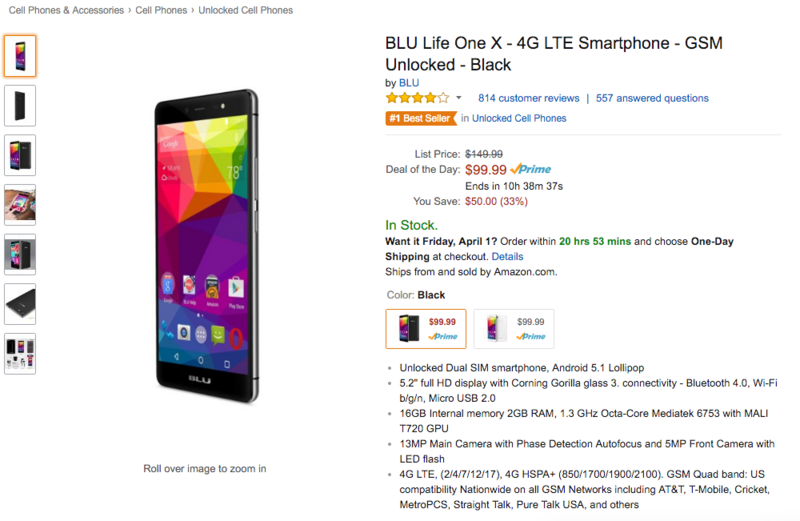 One of Amazon’s Gold Box deals of the day is a Life One X from BLU, a relatively inexpensive Android smartphone with quite a few decent specs. For only $99, down from the usual price of $149, the Life One X features a 5.2″ Full HD display, octa-core Mediatek processor, 2GB of RAM, and 13MP rear-facing camera. Not only are you getting a smartphone with complete access to Google Play for $99, but the packaging also includes a free leather case, screen protector, charging cable, power adapter, and a set of headphones. For $99, that’s a steal. As for which networks this device will work on, it is GSM unlocked, meaning it should be just fine on either AT&T or T-Mobile’s 4G LTE network. Supported prepaid carriers would include Cricket and StraightTalk, just to name a couple. Follow the link below to purchase.